Last week I asked if anyone wanted to take me to Ceviche. And what do you do if no one wants to? You drag your poor boyfriend with you (and lets him pay!). This was a Thursday night and we went there with no reservation but quite early so thought it would work out. Wrong! It was really crowded and the clock had just passed 6pm. However, after a waiter asked us to come back at 9 we kept nagging until we got a table if we promised to leave within one hour. And so I started my first peruvian experience. A Pisco Sour (Pisco = Local produced grape brandy) which is the restaurant’s (and the country’s) special cocktail was our first order. Lime, sugar syrup, egg white and Amargo Chuncho Bitters is mixed with the brandy and made a tasty drink that went very well with the food. Beetroot salad was ok. Would be a winner if it had been room temperated. Now it was cold and I think a lot of the flavours were lost unfortunately. Seabass was my favourite! Soooo good. It melted in your mouth and had the yummy taste of lime and chili. The sirloin skewer and the beef fillet was also very good and rich in flavour. This place now how to marinate meat! And the mac and cheese… very, very good, and quite spicy which I liked a lot! So all in all… the place is expensive, no doubt. An average dish is around £9 so if you eat 7 dishes on 2 people as they recommend that would be £63 and then we add drinks etc.. We ordered 5 dishes (as we had a time limit) and were pretty satisfied. 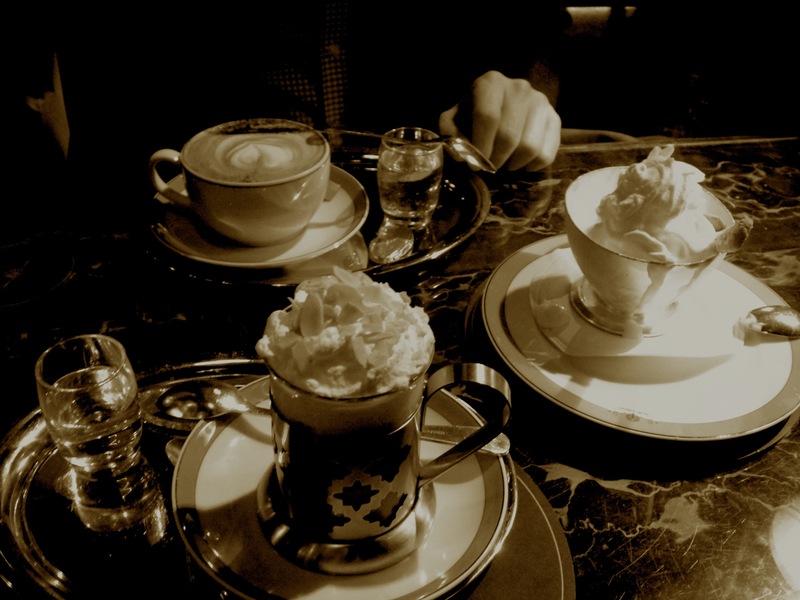 I had a Mozart Coffee drink – Hazelnut Liqueur, long espresso, hot chocolate with creme chantilly and almond flakes. What else would you need a cold thursday night?